The real power of a relational database is in the ability to quickly retrieve and analyze your data by running a query. 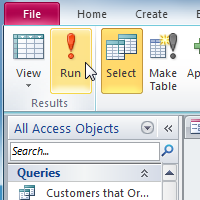 Queries allow you to pull information from one or more tables based on a set of search conditions you define. In this lesson, you will learn how to create a simple one-table query. Then you will learn how to plan and run a slightly more complex multi-table query.